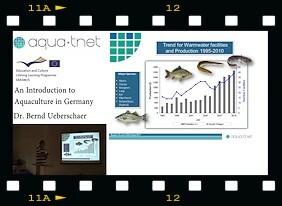 This page provides basic information on aquaculture in various European countries. The information are provided as lectures, presented from representatitves of the related country, recorded and annotated. The individual presentations are listed in the table at the right side of this page. Navigating this site is easy. Please select from the table the country of your choice. Please note: some videos may take time to load into the window because of their size (depending of your Internet connection). If you want to watch the video in a larger format, please click on the "+" sign in the left corner of the video window. The quality of the video can be selected at the lower right corner (240, 360 or 480 px). We would like to thank the following contributors: Bernd Ueberschär (Germany) , Juhani Pirhonen (Finland), Maria Messina (Italy), Antanas Kontautas (Lithuania), Ourania Giannakou (Hellenic aquaculture), Ibon Cancio (Basque country), Magdolna Müllerné Trenovszki (Hungary), Fernando Afonso (Portugal), Hijran Yavuzcan and Hasan H. Atar (Turkey), Odd Ivar Lekang (Norway), Robert Vassallo Agius & John Bostock (Malta). More country presentations coming soon, please come back. If you have any questions regarding this website, find a mistake or have ideas for improvements, please contact Odd Ivar Lekang (odd-ivar.lekang@umb.no) or Bernd Ueberschär (info@bioserve-deutschland.de).